Mouse anti Rat CD31 antibody, clone TLDl-3A12 (MCA1334G) used for the demonstration of vasculature in Rat omentum by immunohistofluorescence. Angiogenesis and macrophage accumuation in visceral peritoneum. Macrophage accumulation (Ed2 positive staining) in omentum (a) and mesentery (b) and angiogenesis (CD31 positive staining) in omentum (c) and mesentery (d) after 5 weeks of PDF exposure and paricalcitol treatment. Representative examples of the omentum with ED2 in green and CD31 in red of control rat (group I), PDF-exposed rat (group III), and PDF-exposed rat treated with paricalcitol (group IV) (e). All data presented as median and interquartiles. Whiskers indicate the extremes. ∗ p <0.05; ∗∗ p <0.01. From: Stavenuiter AW, Farhat K, Vila Cuenca M, Schilte MN, Keuning ED, Paauw NJ, terWee PM, Beelen RH, Vervloet MG. Protective Effects of Paricalcitol on Peritoneal Remodeling during Peritoneal Dialysis. Mouse anti Rat CD31 antibody, clone TLD-3A12 (MCA1334G) used for detection of rat endothelial cells by immunofluorescence. Evaluation of endothelial cell apoptosis with TUNEL staining in frozen sections. Quantification of TUNEL positive cells showed significantly more TUNEL(+) cells/lesion (A) and TUNEL (+) cells/mm2 (B) with treatment of NP-ATPμ-Raf compared to the control group on day 3 and 5 after laser injury. There was a statistically significant reduction of CNV size noted on day 7(C). Double-immunofluorescent staining of frozen sections (x20) obtained at 3, 5 and 7 days after laser photocoagulation for the endothelial cell marker CD31 and TUNEL stain (D). *P<0.01. Data are expressed as the mean ± SE. Mouse anti Rat CD31 antibody, clone TLD-3A12 (MCA1334G) used for detection of ret endothelial cells by immunohistochemistry of tumor cryostat sections. Comparison of tumour microvessel fractal dimension and diameter in control and rhEPO-treated rats. (A, B) Examples of CD31-stained microvessels in the tumour core of control and rhEPO-treated animals. Bar, 25 μm. (C) Microvessel fractal dimension in the tumour core and rim in control and rhEPO-treated animals. Columns, mean; bars, s.e. ; *P=0.006. (D) Microvessel diameter in the tumour core and rim in control and rhEPO-treated animals. Columns, mean; bars, s.e. ; *P<0.001; **P=0.07. 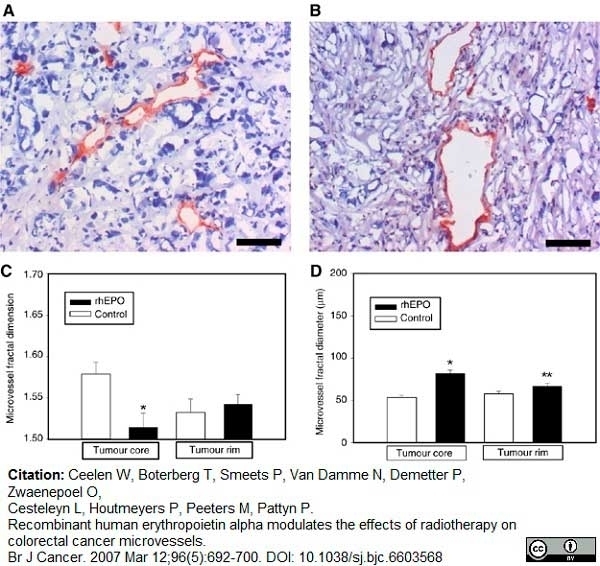 From: Ceelen W, Boterberg T, Smeets P, Van Damme N, Demetter P, Zwaenepoel O, Cesteleyn L, Houtmeyers P, Peeters M, Pattyn P. Recombinant human erythropoietin alpha modulates the effects of radiotherapy on colorectal cancer microvessels. Br J Cancer. 2007 Mar 12;96(5):692-700. Mouse anti Rat CD31 antibody, clone TLD-3A12 (MCA1334G) used for the detection of mesenteric vasculature in rats by immunofluorescence. (A) Portal-systemic shunting in common bile duct-ligated (CBDL) rats treated with vehicle or brilliant blue G (BBG, CBDL-vehicle: n = 5; CBDL-BBG: n = 7). Compared with vehicle, BBG significantly improved the severity of shunting. (B) Mesenteric vascular density in sham or CBDL rats treated with vehicle or BBG (sham-vehicle: n = 6; sham-BBG: n = 6; CBDL-vehicle: n = 6; CBDL-BBG: n = 9). Vascular area and length per unit of mesenteric window area were significantly reduced in CBDL rats with BBG treatment. ap<0.05 vs. sham-vehicle group. bp<0.005 vs. sham-BBG group. cp<0.005 vs. CBDL-vehicle group. 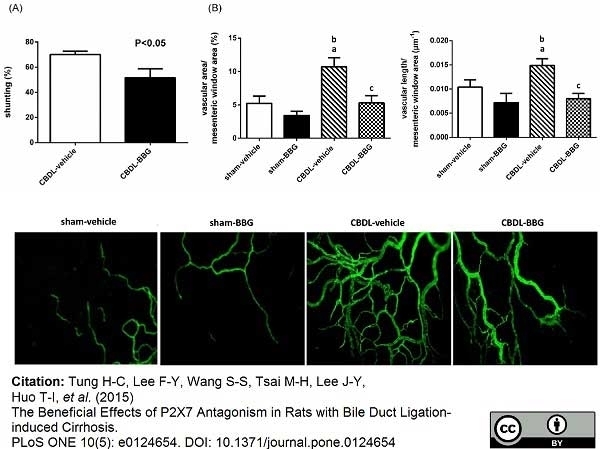 The Beneficial Effects of P2X7 Antagonism in Rats with Bile Duct Ligation-induced Cirrhosis. Mouse anti Rat CD31 antibody, clone TLD-3A12 (MCA1334G) used for the quantitation of vascular channels in venous thrombi by western blotting. Effects of Temporary Dietary Iron Restriction on Leukocyte Recruitment, Neovascularization, and Plasmin System of Stasis-Induced Venous Thrombi in Rats. (A) Representative images of CD68 staining of the venous thrombi. Scale bars: 100 μm. (B) Quantification of CD68 positive cells in the venous thrombi of the DVT and DVT+IR groups (n = 6 in each group). (C) Representative images of vWF staining of the venous thrombi. Scale bars: 50 μm. Arrows show vascular channels. (D) Quantification of vascular channels in the venous thrombi of the DVT and DVT+IR groups (n = 6 in each group). The number of CD68 positive cells or vascular channels in 10 randomly selected high power fields (HPF) was counted in a blinded manner. (E) CD31 protein expression (top; representative gel blots depicting expression of CD31 and GAPDH, bottom; relative levels of expression) in the venous thrombi of the DVT and DVT+IR groups (n = 5 in each group). (F) Intrathrombotic gene expression of uPA, tPA, PAI-1, and fibrinogen α chain in the DVT and DVT+IR groups (n = 4 in each group). *p < 0.05 versus the DVT group. Temporary Dietary Iron Restriction Affects the Process of Thrombus Resolution in a Rat Model of Deep Vein Thrombosis. Mouse anti RatCD31 antibody, clone TLD-3A12 (MCA1334G) used for the detection of rat CD31 by immunohistochemistry on paraffin embedded tissue sections. Effects of the PPAR-δ agonist GW610742 on angiogenesis.Representative images from the sham-operated (Sham), myocardial infarction alone (MI), and MI treated with GW610742 (MI + GW) groups on day 7 (A) and day 14 (B) post-surgery. Images using Masson's trichrome staining (MT) show vessels (arrows) in the heart post-operation. The immunoreactivity and positive cell numbers for CD31 and Ki-67 (arrows) were counted in each group post-operation. Values are represented as the mean ± the standard error of the mean (SEM). *P < 0.05 and vs. **P < 0.01 the corresponding MI group. Scale bars = 100 μm and 50 μm for MT, CD31, and Ki-67 staining, respectively. Sham (n = 3/each day), MI (n = 7/each day), MI + GW (n = 7/each day). From: Park JR, Ahn JH, Jung MH, Koh J-S, Park Y, Hwang S-J, et al. (2016) Effects of Peroxisome Proliferator-Activated Receptor-δ Agonist on Cardiac Healing after Myocardial Infarction. 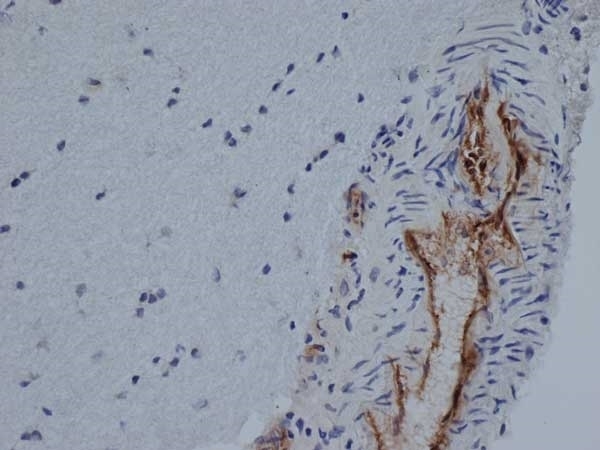 Mouse anti RatCD31 antibody, clone TLD-3A12 (MCA1334G) used for the detection of rat CD31 by immunohistochemistry paraffin embedded tissue sections. 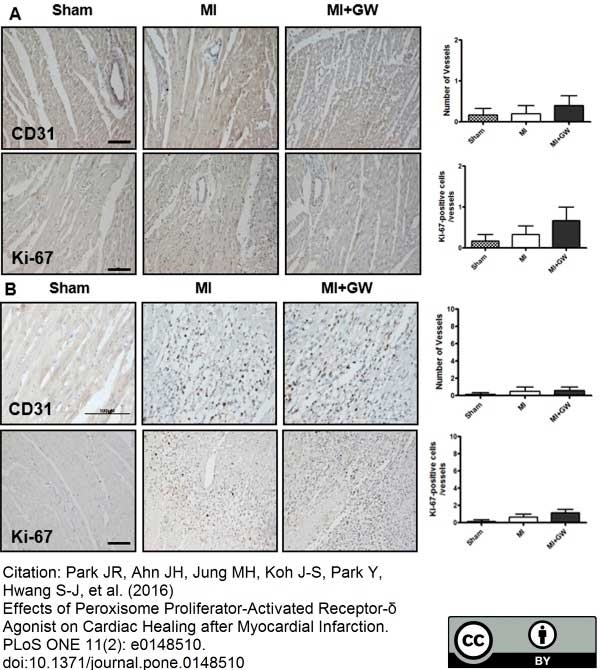 Effects of the PPAR-δ agonist GW610742 on angiogenesis.Effects of GW610742 on cardiac angiogenesis on day 0 and day 3 post MI. Representative images from the sham-operated (Sham), myocardial infarction alone (MI), and MI treated with GW610742 (MI + GW) groups on day 0 (Figure A) and day 3 (Figure B) post-surgery. Images for CD31 and Ki-67 staining show a few vessels in the heart post-operation. The immunoreactivity and positive cell numbers for CD31 and Ki-67 were counted in each group. Values are represented as the mean ± SEM. Scale bars = 100 μm and 50 μm for CD31 and Ki-67 staining, respectively. Sham (n = 3), MI (n = 7), MI + GW (n = 7). Mouse anti Rat CD31 antibody, clone TLD-3A12 (MCA1334G) used for the demonstration of CD31 expressing cells in rat epicardial tissue sections by immunofluorescence. Improved donor cell survival by epicardial PM-MSC coating. (b–d). Immunofluorescence demonstrated that the PM-MSC complex (orange; labelled with CM-DiI) covered the surface of LV walls (both peri-infarct and infarct areas) at 1 h (b), Day 3 (c), and Day 28 (d). 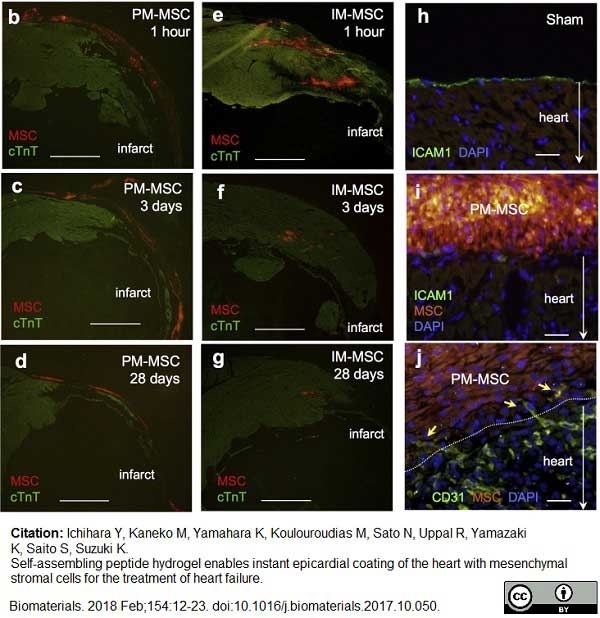 The majority of surviving MSCs retained on the heart surface. Scale bar = 1 mm (e–g). Immunofluorescence demonstrated that donor cells in the IM-MSC group were found forming isolated cell-clusters (orange; labelled with CM-DiI) at 1 h (e), Day 3 (f), and Day 28 (g). The surviving donor cell numbers in the IM-MSC group appeared to be smaller compared to the PM-MSC group. Scale bar = 1 mm (h–j). Immunolabeling detected a monolayer of epicardial cells (green) on the surface of heart in the Sham group (h). The epicardial cells disappeared by one day after PM-MSC placement (i). There were sprouting vessels (green) from the heart into the PM-MSC complex by Day 3 after placement (j). Scale bar = 50μm. From: Ichihara Y, Kaneko M, Yamahara K, Koulouroudias M, Sato N, Uppal R, Yamazaki K, Saito S, Suzuki K.
Mouse anti Rat CD31 antibody, clone TLD-3A12 (MCA1334GA) used for the evaluation of vessel formation in rat myocardium by immunofluorescence. Myocardial angiogenesis. (A) Immunofluorescence staining for endothelium (CD31, in red), pericytes (NG2, in green), smooth muscle cells (SMA, in cyan) and nuclei (DAPI, in blue) in sections of myocardium injected with phosphate‐buffered saline, control cells (CD8) or ASC expressing uncontrolled heterogeneous levels (ALL) or a specific homogeneous VEGF level (SPEC). 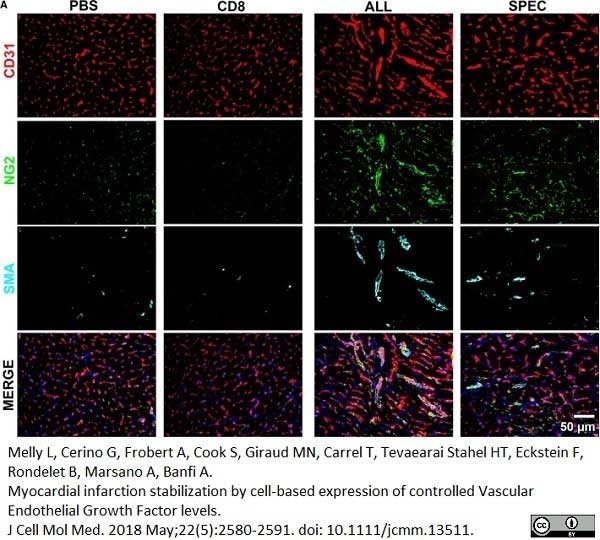 From: Melly L, Cerino G, Frobert A, Cook S, Giraud MN, Carrel T, Tevaearai Stahel HT, Eckstein F, Rondelet B, Marsano A, Banfi A.
Myocardial infarction stabilization by cell-based expression of controlled Vascular Endothelial Growth Factor levels. J Cell Mol Med. 2018 May;22(5):2580-91. Cell engraftment. Survival of human ASC was assessed by immunostaining for (HLA)‐Class I (red), while endothelium was detected by CD31 expression (green), and nuclei by DAPI staining (blue) 4 weeks after injection of phosphate‐buffered saline, control cells (CD8) or the two VEGF ‐expressing populations (ALL and SPEC). White arrows indicate single engrafted human cells. Mouse anti Rat CD31 antibody, clone TLD-3A12 recognizes rat PECAM-1 (CD31), a 661 amino acid type 1 transmembrane protein expressed primarily on endothelial cells, platelets and leucocytes. Clone TLD-3A12 has been shown to partially block the proliferative response of antigen-specific CD4+ T cells to antigen-presenting cells and relevant antigen (Stevenson, K.S. et al.2009). Activated, Lewis rat derived microglial cells. Spleen cells from immunised BALB/c mouse were fused with cells of the mouse SP2 myeloma cell line. Williams, K.C. et al. (1996) PECAM-1 (CD31) expression in the central nervous system and its role in experimental allergic encephalomyelitis in the rat. J Neurosci Res. 45 (6): 747-57. Nakao, A. et al. (2003) Carbon monoxide inhalation protects rat intestinal grafts from ischemia/reperfusion injury. Am J Pathol. 163: 1587-98. Stevenson, K.S. et al. (2009) Isolation, characterization, and differentiation of thy1.1-sorted pancreatic adult progenitor cell populations. Stem Cells Dev. 18 (10): 1389-98. Ott, I. et al. (2005) Endothelial-like cells expanded from CD34+ blood cells improve left ventricular function after experimental myocardial infarction. FASEB J. 19 (8): 992-4. Fujimoto, K.L. et al. (2007) An elastic, biodegradable cardiac patch induces contractile smooth muscle and improves cardiac remodeling and function in subacute myocardial infarction. J Am Coll Cardiol. 49: 2292-300. Thebault, P. et al. (2010) The C-type lectin-like receptor CLEC-1, expressed by myeloid cells and endothelial cells, is up-regulated by immunoregulatory mediators and moderates T cell activation. Graham, M.J. et al. (1998) In vivo distribution and metabolism of a phosphorothioate oligonucleotide within rat liver after intravenous administration. J Pharmacol Exp Ther. 286: 447-58. Haywood, L. et al. (2003) Inflammation and angiogenesis in osteoarthritis. Kielian, T. and Hickey, W.F. (2010) Proinflammatory cytokine, chemokine, and cellular adhesion molecule expression during the acute phase of experimental brain abscess development. Am J Pathol. 157: 647-58. Lochhead, J.J. et al. (2010) Oxidative stress increases blood-brain barrier permeability and induces alterations in occludin during hypoxia-reoxygenation. J Cereb Blood Flow Metab. 30: 1625-36. Arkudas, A. et al. (2007) Fibrin gel-immobilized VEGF and bFGF efficiently stimulate angiogenesis in the AV loop model. Nakao, A. et al. (2011) Ex vivo carbon monoxide delivery inhibits intimal hyperplasia in arterialized vein grafts. Ohnishi, T. et al. (2007) Comparison of endothelial cell proliferation in normal liver and adipose tissue in B6C3F1 mice, F344 rats, and humans. Schilte, M.N. et al. (2009) Long-term intervention with heparins in a rat model of peritoneal dialysis. Perit Dial Int. 29: 26-35. Seegers, H.C. et al. (2003) Enhancement of angiogenesis by endogenous substance P release and neurokinin-1 receptors during neurogenic inflammation. J Pharmacol Exp Ther. 306: 8-12. Wilson, E. et al. (2007) An evaluation of the immunohistochemistry benefits of boric acid antigen retrieval on rat decalcified joint tissues. J Immunol Methods. 322: 137-42. Willis, C.L. et al. (2010) Protein kinase C activation modulates reversible increase in cortical blood-brain barrier permeability and tight junction protein expression during hypoxia and posthypoxic reoxygenation. J Cereb Blood Flow Metab. 30: 1847-59. Salehi-Had, H. et al. (2011) Utilizing targeted gene therapy with nanoparticles binding alpha v beta 3 for imaging and treating choroidal neovascularization. MacLean, A.G. et al. (2001) Rhesus macaque brain microvessel endothelial cells behave in a manner phenotypically distinct from umbilical vein endothelial cells. Ceelen, W. et al. (2007) Recombinant human erythropoietin alpha modulates the effects of radiotherapy on colorectal cancer microvessels. Br J Cancer. 96: 692-700. Tung, H.C. et al. (2015) The Beneficial Effects of P2X7 Antagonism in Rats with Bile Duct Ligation-induced Cirrhosis. PLoS One. 10 (5): e0124654. Oboshi, M. et al. 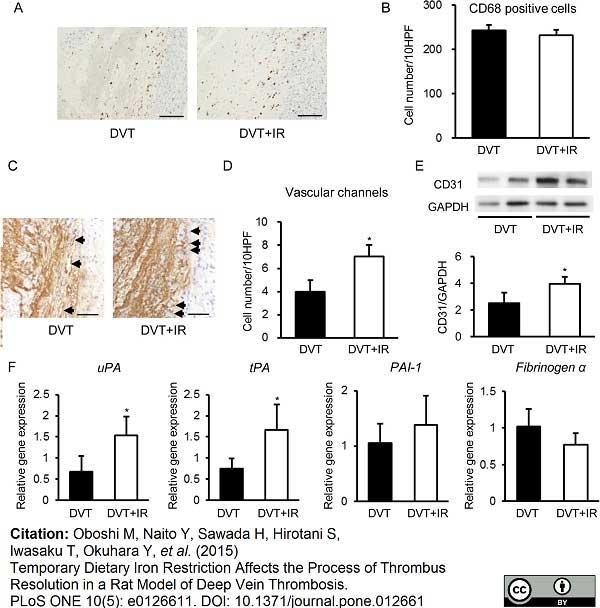 (2015) Temporary dietary iron restriction affects the process of thrombus resolution in a rat model of deep vein thrombosis. PLoS One. 10 (5): e0126611. Wu, S.H. et al. 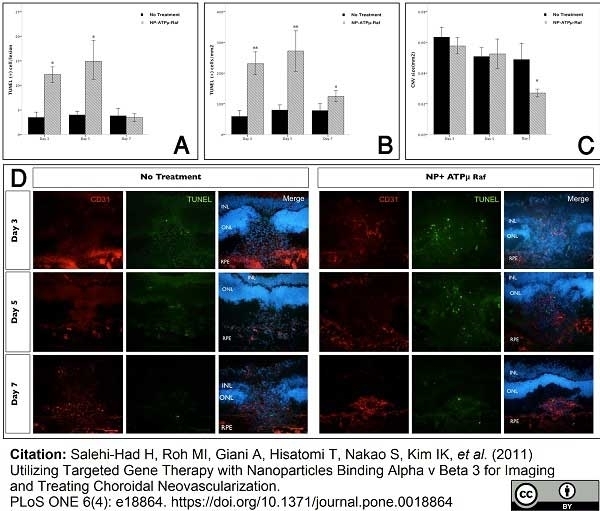 (2015) Autologous adipose-derived stem cells attenuate muscular atrophy and protect spinal cord ventral horn motor neurons in an animal model of burn injury. Ikutomi, M. et al. (2015) Diverse contribution of bone marrow-derived late-outgrowth endothelial progenitor cells to vascular repair under pulmonary arterial hypertension and arterial neointimal formation. J Mol Cell Cardiol. 86: 121-35. Ferrantelli, E. et al. (2016) The dipeptide alanyl-glutamine ameliorates peritoneal fibrosis and attenuates IL-17 dependent pathways during peritoneal dialysis. Kidney Int. 89 (3): 625-35. Lux, M. et al. (2016) In vitro maturation of large-scale cardiac patches based on a perfusable starter matrix by cyclic mechanical stimulation. Teng, B.T. et al. (2011) Protective effect of caspase inhibition on compression-induced muscle damage. Journal of Oral Biosciences. 57 (3): 157-64. Kakaiy, A. et al. (2015) Comparing protective effect of grape seed extract versus atorvastatin on endometriosis in rat model: Evidence for immunohistochemical and biochemical alterations. Vet Res Forum. 6 (2): 101-10. Brandl, A. et al. (2014) A novel early precursor cell population from rat bone marrow promotes angiogenesis in vitro. BMC Cell Biol. 15: 12. Sun, C.K. et al. (2015) Mixed serum-deprived and normal adipose-derived mesenchymal stem cells against acute lung ischemia-reperfusion injury in rats. Am J Transl Res. 7 (2): 209-31. Biomedical Research. 35 (6): 397-405. Park; J.R. et al. (2016) Effects of Peroxisome Proliferator-Activated Receptor-δ Agonist on Cardiac Healing after Myocardial Infarction. PLoS One. 11 (2): e0148510. Naaijkens BA et al. (2015) Acute myocardial infarction does not affect functional characteristics of adipose-derived stem cells in rats, but reduces the number of stem cells in adipose tissue. Cell Tissue Res. 362 (3): 623-32. Lim S et al. (2016) Attenuation of carotid neointimal formation after direct delivery of a recombinant adenovirus expressing glucagon-like peptide-1 in diabetic rats. Stavenuiter, A.W. et al. (2015) Protective Effects of Paricalcitol on Peritoneal Remodeling during Peritoneal Dialysis. Biomed Res Int. 2015: 468574. Frye, C.A. & Patrick, C.W. Jr (2002) Isolation and culture of rat microvascular endothelial cells. In Vitro Cell Dev Biol Anim. 38 (4): 208-12. Jiang, Y. et al. 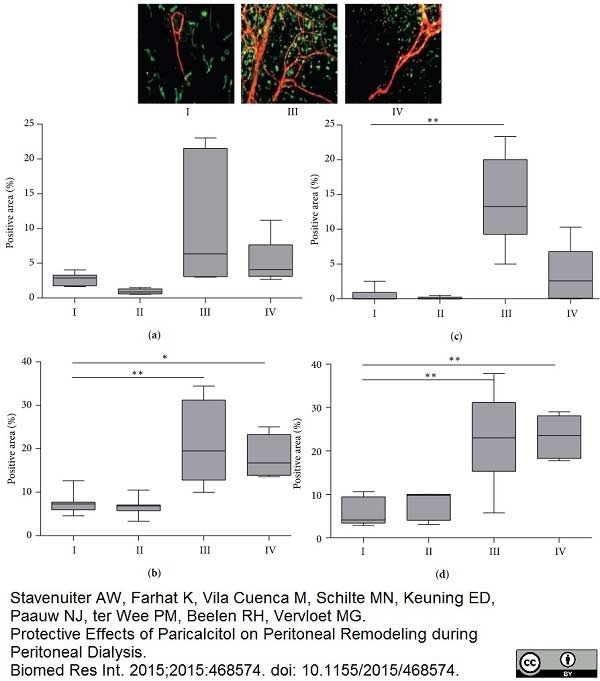 (2015) SOD1 nanozyme salvages ischemic brain by locally protecting cerebral vasculature. J Control Release. 213: 36-44. Mirzaei, M. et al. (2017) Nanosilver particles increase follicular atresia: Correlation with oxidative stress and aromatization. Environ Toxicol. 32 (10): 2244-55. Sønstevold,T. et al. (2017) Hyperbaric oxygen treatment did not significantly affect radiation injury in the mandibular area of rats. Oral Surgery, Oral Medicine, Oral Pathology and Oral Radiology. [Epub ahead of print]. Ichihara, Y. et al. (2018) Self-assembling peptide hydrogel enables instant epicardial coating of the heart with mesenchymal stromal cells for the treatment of heart failure. Melly, L. et al. 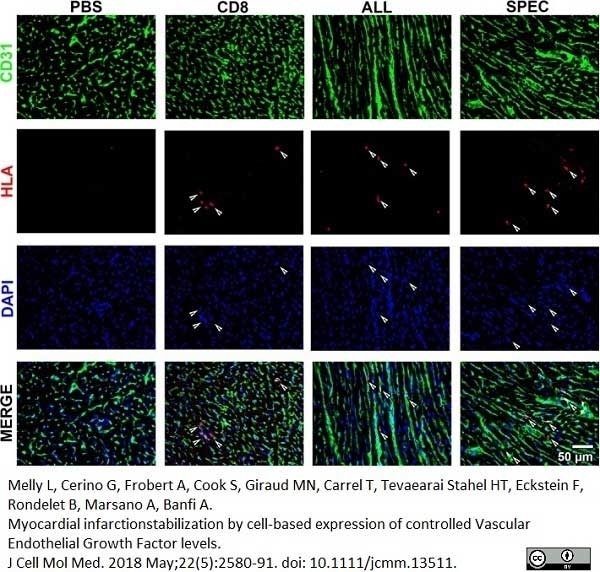 (2018) Myocardial infarction stabilization by cell-based expression of controlled Vascular Endothelial Growth Factor levels. J Cell Mol Med. 22 (5): 2580-91.